The Student Media Congress (SMC), on its 3rd year, will open its gates once more to students and media practitioners who want to learn and experience the world of media through a two-day congress on October 16-17, 2015 that will take place in De La Salle University-Manila. With the theme, Experiencing Media Dynamics, the Congress will offer 5 plenary talks, 15 Competing and 60 Non-Competing workshops on a wide variety of topics that consistently and constantly challenge the status quo to innovate and grow. The Congress team will once again summon an army of media experts to share knowledge that can be created through the transformation of experience. The Congress will challenge the delegates to think about how they can reach their audiences through all the different senses and make them experience what the landscape has to offer. 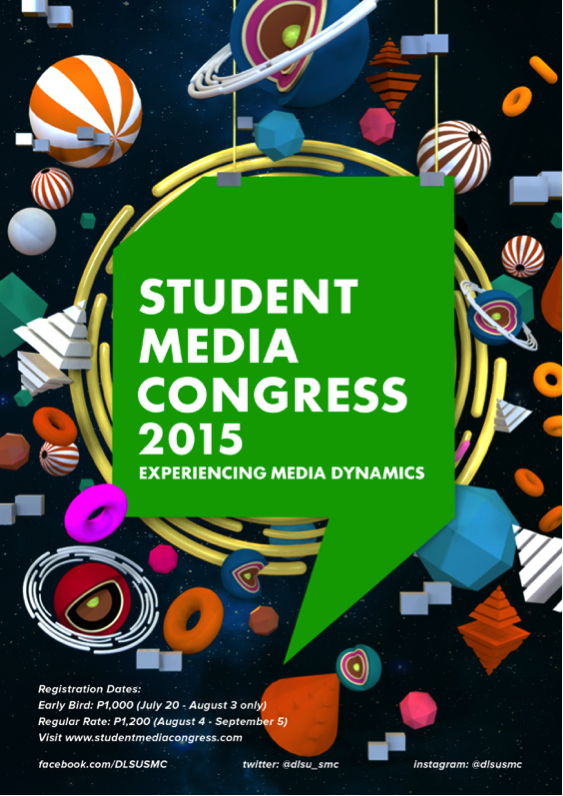 The 3rd Student Media Congress (SMC) will have its Early Bird registration on July 20, 2015until August 3, 2015 for only 1000 pesos. While, the Regular Registration will run on August 4, 2015 and will end on September 5, 2015 for 1,200 pesos.